Sony gets 'Sirius' about 4K video | What Hi-Fi? Leaked images allegedly showing screenshots of the upcoming Sony 'Sirius' smartphone – a codename that most likely represents Sony's next flagship phone, the Z2 – show an option to record 4K video. Other features appear to show the ability to record at a higher frame-rate, for slow motion video. 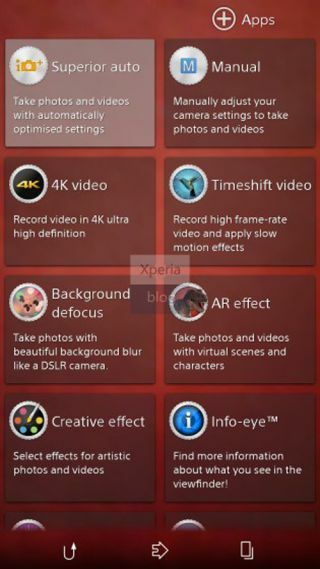 The screenshots, posted on Sony fansite Xperia Blog, quite accurately resemble previous Sony Xperia user interfaces, which makes them a little more believable. The new Xperia Z2 smartphone is said to come running Qualcomm's new 2.3GHz Quad-core Snapdragon 800 processor, which should be able to allow for 4K recording. As well as the screenshots, other images on the site point to dual speakers, at the top and bottom of the phone, presumably in a bid to improve the usually pretty average quality of smartphone sound. Sony is expected to show off the new flagship at MWC 2014 next month after unveiling the Xperia Z1 Compact at CES 2014.